Trying to find the best mini-shotgun for HDSLR shooting? Chad Johnson did a pretty solid test of the major contenders: the Sennheiser MKE400, Rode VideoMic Pro, Que Audio Micro Shotgun, and Rode VideoMic. The Rode Pro sounds fatter, the Senn sounds thin. The Rode Pro didn’t do as good a job rejecting side and (especially) rear noise. Nice thorough test. Good job. Rode beat the pants of the Senn and the Q. 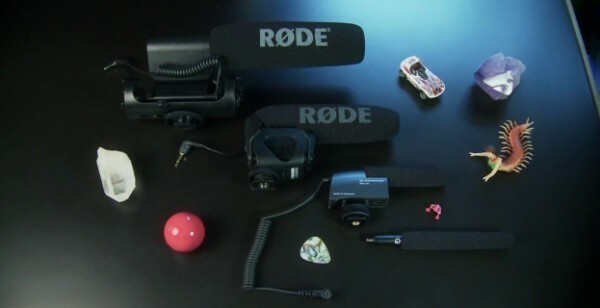 The Rode is the only mics that sound normal. What do you mean ” sound normal”? I didn’t like the way you tested those mics. Something wrong with that Senn!! I listen on other site (youtube), with a very good test (in real life) with that same Sennheiser, and it is the best one I’ve ever heard in that category of separate mics for SLR , a lot better then Rode. • FYI Claude, one are supposed to have a shotgun mic close. “Shotgun” doesn’t mean “ok to use far away”. Mounted on the camera is the worst place for a mic. That’s why we ave boml ops to hold the mic close to the speaker’s mouth. • No I wasn’t outside, but if a mic sounds better here, it will sound better outside. I did do a side rejection test, which gives you the information you need. • All the mics are mono. There is a new Stereo VideoMicPro from Rode, but the mic in this shootout from a year ago is the original mono version of the VideoMic Pro. • The Senn is in perfect working order. It sounds better plugged into a 3.5mm jack, than with an XLR adapter. To learn more about audio, I suggest the Audio forum at http://www.dvxuser.com. There are lots of pros there to help you understand the proper way to use mics for video production. Be sure and read the stickies!